A popular gateway to the Great Barrier Reef and the vast wilderness of Cape York Peninsula, the major centre in Tropical North Queensland is Cairns. The city is fringed by lush rainforests and, to the north and south, are miles of white sandy beaches and turquoise oceans teeming with marine life. From the reef to the rainforest and from Smithfield, an outer suburb, take the Skyrail, a gondola cableway over the rainforest to Kuranda, a picturesque village on the edge of the Tropical Tablelands. Visit a range of unique natural and cultural attractions, go for a cruise on the river, or shop for local art and crafts and at the end of the day take the famous Kuranda Scenic Rail back to Cairns. There are numerous choices of motels, in and around Cairns. Other accommodation varies from 5 star hotels down to 1 star backpackers. You'll find a complete range of motels, hotels, serviced apartments, suites, eco-lodges, resorts and backpacker accommodations, in all parts of Cairns and neighbouring locations. Major international and local chains with a presence include Radisson, Hilton, Holiday Inn, Metro Hospitality Group and Rydges. Our featured property is a 3 star complex comprising an accommodation mix of motel rooms, one and two bedroom apartments. This property is situated on the Bruce Highway as you drive into Cairns from the south, and is approximately 5 minutes from the city. 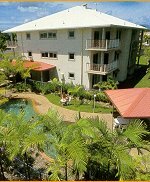 The 3.5 star complex has a mix of motel and serviced holiday apartments accommodation in a cool, tropical style environment near the Trinity Inlet in the Cairns City southern gateway. The property is a popular choice for Queensland, interstate and overseas visitors. The resort-style apartments are airconditioned and contain ceiling fans, a private balcony, televison, laundry facilities and a fully equipped kitchen. Motel rooms include ensuite, airconditioning, ceiling fans, refrigerator and tea and coffee making facilities. This affordable accommodation property, built in the mid 1990s, also offers spacious, easy access undercover parking.